← You Mirror What The World Mirrors To You. Fear Is Nothing But Love Upside Down. Fear is one of the greatest problems in life. A mind that is caught in fear lives in bewilderment, in disagreement, and therefore is violent, distorted and aggressive. This mind never ventures to move away from its own patterns of thinking, and this raise insincerity. Until we are free from fear, no amount of climbing the highest mountain, or inventing a different brand of God will free us from fear. It is, obviously, understandable that people are shocked when something like the Boston bombing happens. Such an attack is a shocking thing—the images, the video, the beautiful faces of the three young people whose lives were taken; all shocking. But in today’s world, it isn’t really a surprising thing. After 9/11, how can anyone be surprised? In fact, I would take it back further. After the 1993 World Trade Center bombing, and after Oklahoma City, how could anyone have been surprised? We’re not immune anymore. We’ve joined the rest of the world, the bloodied and sundered world that has lived with terrorism for decades. A little perspective: the Boston attack was the fourth-worst terrorist attack of the week around the world. And that was only by Wednesday. Of course, when a young person dies it is tragic, this is the reality. We can slice and dice our ideas of the after life and paint whatever picture we choose, but the bottom line is, a life lost so young impacts many, and the grief stretches far. No one likes to think about it or hear it, but we have to accept it in order to move on to the next step. You can’t stop death, you can only try to live as healthy as you can and extend your life. But fearing something that will happen 100% guaranteed is nothing to fear. Because you don’t have control over whether it will happen. You can control perhaps when it may happen by taking preventative measures, but you will not avoid it. Accept it….and then you can move on. There is nothing to fear. The only real fear should be regret….regret of having never really lived with the time you were given. Because the idea of death evokes a number of fears, researchers have suggested that the fear of death is actually a multidimensional concept. Early humans understood death to be a gateway to an afterlife. The belief that humans live on after death is almost universal. In order to understand the ancient Egyptian concept of death and dying, one must first understand the absolute longing and love for life the ancient Egyptians had. The latter devotion and love for life propelled the ancient Egyptian people into an obsessive desire or their lives to continue in heaven [the field of reeds] in the same manner of luxury, pomp and pageantry as their lives had been whilst they were alive. Therefore, it was not the ancient Egyptians desire for death that propelled them to such extreme preparations for the afterlife. On the contrary, it was a desire for life to continue with all of its trappings that was the driving force behind their obsessive preparations for death. To have everything in heaven that one had in life was the ultimate goal for the afterlife of the ancient Egyptian’s. However, the ancient Egyptian belief regarding heaven suggests they believed one’s eternal life in the afterworld [the field of reeds] could be more plentiful and comfortable both spiritually and materialistically than their lives had been before death. Illustrations on tomb walls provide evidence of the bountiful crops, abundance of food, and fine clean clothes worn by the deceased in the field of reeds, which provides evidence for the latter. The anthropological, philosophical, and psychoanalytic perspectives offer evidence and rationales that the fear of death is a natural response, given all the attempts of biological organisms to preserve life. Throughout human history, fear has been the universal response to death. The dark or evil side of reality, often projected onto the “other,” is, in fact, a common belief in many cultures. This creation of a moral enemy is connected with a basic feature of human psychology and social organization: the “us versus them” dichotomy. The beliefs and values of a culture, which include their myths, not only provide a core set of ideas that unite a culture, but these beliefs and values (what we can call an “ideology”) frequently create an oppositional adversary of other cultures. Those outside a group – the “other” – are often seen as a morally inferior enemy to which a double standard of values is commonly applied. Cooperation (and other associated virtues such as love and harmony) is encouraged and reinforced within a cultural group, whereas war, violence, and conquest are morally sanctioned toward other people and cultures outside of the group. It is interesting that these two sets of standards closely align with the two fundamental forces of competition and cooperation. Thus the ideology of a people not only gives them a sense of identity and distinguishes the culture but also sets it in opposition to other cultures and creates an “us versus them” mindset. Yet, in contrast to the view, that religion emerged as a response to the fear of death and the transitory quality of life, the worship of gods expresses the wonder and mystery humans feel in response to the world. Both explanations, positive and negative, certainly are true. The two views embody the two polarities of human motivation – to approach and to avoid. Life is something to fear and something to love and embrace, and so is God. The rise of individuality with the illusion of self- sufficiency fosters an emergence of the fear of death. In societies that foster individuality, fear of death logically follows. 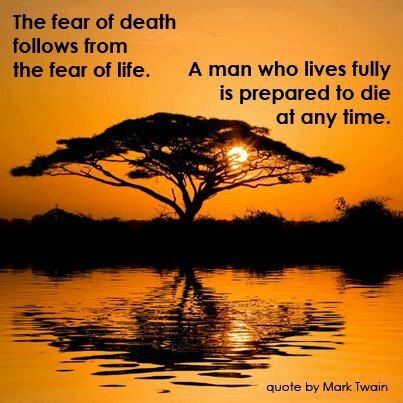 In traditional and rural cultures, on the other hand, the fear of death is not as strong. Such arguments seem to suggest, however, that if the cultural response in a given society is not to fear death, individuals within that culture do not respond to death with fear. This is a premise that requires empirical validation. Perhaps the most useful conception of the fear of death may be that it is a variable subject to manipulation by social context. A society’s culture may offer explanations of death that either repress or encourage fears about death according to the needs of the society. Because of the complexity of death fears, scholars have debated whether such fears are natural or whether they are social constructs. The most common view that runs through the history of thought on death is that the fear of death is innate, that all of life tends to avoid death, and that the underlying terror of death is what drives most of the human endeavor. To combat death anxiety, however, modern society produces a full array of diversions that take our minds off of death. At the core of all human endeavors, says Ernest Becker (1973), is the terror of death. Because all individuals instinctively fear their own annihilation, death confers a narcissistic need to preserve the individual’s self-esteem in the face of the pointlessness of life. What humankind fears most is not extinction, says Scimecca (1979), but “extinction without meaning”. According to some, society provides a “cultural hero system” that creates and perpetuates the myth of the significance of human life. The concept of death is intricately tied to the human body. It is the body that dies. The body is corruptible; the body is the recipient of disease and subject to decay. It is the physical corpse that rots away, whereas the soul, according to many belief systems, is set free and lives forever. The body feels pain, and bodily misery is the source of most human misery. Passion is of the body; contemplation is of the soul. Man’s body can thus make him a slave to passion while the contemplative power of his spirit sets him free. This basic fact is behind many religious practices, philosophical systems, and science (Heinz 1999). A major function of culture, then, is to structure pleasure fulfillment of the body in a manner that supports the continuity of society. Reason, law, religion, science, even magic—all products of the contemplative mind—discipline the body, structure bodily movements, and set restraints on the desires of the body (Jones 2001). The primary struggle throughout human history is thus that between reason and passion, between the mind and the body. There is much about death to fear: Whether by accident, disease, or intentional infliction by another human, the path to death for all but a few fortunate humans is accompanied by pain. Death can also be a lonely and isolating experience (Feder 1976). Humans are social beings, and it is our interactions with other humans that complete our existence and give our lives meaning. Death is thus separation from everything that gives our life form; it is the loss of everything that we hold dear. The loss of a loved one to death is often one of the most emotionally painful experiences that a human can have. Even when the death is not that of a loved one, simply being a witness to death can evoke a natural horror and revulsion. Furthermore, because of its seeming finality, death presents one of the most formidable challenges to the idea that human life has meaning and purpose. Given these facts, it should be no surprise that fear has been one of the most commonly expressed responses of humans to death. What is fear made of? Fear is made of ignorance of one’s own self. There is only one fear; it manifests in many ways, a thousand and one can be the manifestations, but basically fear is one, and that is that “Deep inside, I may not be.” And in a way it is true that you are not. Godliness is, you are not. At least it keeps you fooled, it keeps the illusion intact that “I am”. But because this feeling of “I amness” is false, it creates fear. You know that anything can destroy it, any deep encounter can shatter it. It can be shattered by love, it can be shattered by a serious disease, it can be shattered by seeing someone die. It can be shattered in many ways, it is very, very fragile. You are managing it somehow by not looking in. When we watch, what is actually taking place within ourselves and outside of us in this competitive culture in which we live with its desire for power, position, prestige, name, success and all the rest of it, we see fear is not merely on the surface of the mind. To dig deep, we have to go into it deeply, because fear is not merely on the surface of the mind. For deep probing, we need a very sharp intellect, and intellect is not sharpened by arguments or avoidance. Get to the problem step by step by comprehending this whole process of naming system. The name, the word, prevents us from being a human being in relationship with other human beings. Likewise, when we name a feeling, we are not looking at the feeling; we are not totally with the fact. We have all known fear. For some of us fear is a constant companion, the underlying force in our lives that keeps us feeling “stuck” or “safe” as the case may be. Sometimes it has saved us from entering into a dangerous situation. Other times it may have prevented us from pursuing something that could have been a life-changing opportunity. Fear can keep us from boarding airplanes, from falling in love, from asking for a raise, and perhaps the saddest of all, from fulfilling our true purpose here in this lifetime. Fear insinuates itself into our emotional fiber, so the more power we give to it the more it demands. It speaks to us constantly, a catastrophic song about one thing or another, and we continue to listen. What is this thing “fear” that lords over us, calling the shots and robbing us of our peace of mind? Who or what is it that speaks? Is it us? Are we the voice of fear? It can certainly feel like that sometimes. Before we can begin to free ourselves from the grip of fear and its negative effects, we need to understand the true nature of fear. In the beginning, we were given instincts to help us survive. We had a heightened sense of our environment so that we could nourish ourselves and procreate. As time went on we became more dependent upon machines and technology for our quality of life and survival. As a result, our instincts and senses diminished and our mental processes strengthened. As we became more and more identified with our minds as our source of supply and safety, our thoughts and emotions carried more weight. Fear shifted its focus from our instinctual nature to our emotional nature. It is the imbalance of our emotions that create toxic levels of fear. We strengthen what we focus on. The more attention we give to fear the stronger it gets. The key to overcoming the debilitating affects of fear is to bring our emotional, instinctual and spiritual natures into balance and harmony. Fear is as non-substantial as your shadow, but it is. The shadow also exists — non-substantial, negative, but not non-existential — and sometimes the shadow can have a great impact on you. In a jungle when the night is approaching you can be frightened of your own shadow. In a lonely place, on a lonely path, you can start running because of your own shadow. Your running will be real, your escaping will be real, but the cause will be non-substantial. You can run away from a rope thinking that it is a snake; if you come back and you look closely and you observe, you will laugh at the whole stupidity of it. But people are afraid to come to places where fear exists. People are more afraid of fear than of anything else, because the very existence of fear shakes your foundations. Remember, the shaking of the foundations is very real. Fear is like a dream, a nightmare, but after a nightmare when you are awake the after-effects still persist, the hangover persists. Your breathing has changed, you are perspiring, your body is still trembling, you are hot. Now you know that it was just a nightmare, a dream, non-substantial, but even this knowing will take time to penetrate to the very core of your being. Meanwhile the effect of the non-substantial dream will continue. Fear is a nightmare. We do not find happiness by suppressing emotions like stress or fear. They were archetypes of the “dark side.” Figures, such as Satan in Christianity, still served a moral purpose, for they illustrated what to avoid, fear, or fight against in life. According to fMRI studies, acting in the face of uncertainty lights up a part of the brain known as the amygdala, which is a primary seat of fear and anxiety. That sends a surge of chemicals through our bodies that makes us want to run. The part of the brain that helps keep fear and anxiety in check — the prefrontal cortex, or PFC — is also tasked with managing working memory. Problem is, it’s easily overloaded. Doing too many things as once lessens its ability to keep the discomfort that tags along with moving into uncertainty at bay and makes you more likely to shut down. Only by rejecting multitasking and focusing on a single task at a time can you harness your full brainpower for optimal performance. FEAR AND stress are very similar. They oftentimes feel the same. If we truly understand fear and get a clear picture of what is happening when we feel fear, we can oftentimes dispense with the need to fear things at all. When you feel ‘stressed’, what do you think is the underlying emotion? If you feel irritated and frustrated when your children won’t cooperate, you might think that the emotion is anger, but I suspect, if you looked underneath the anger, there would be some fear. Remembering that I’ll be dead soon is the most important tool I’ve ever encountered to help me make the big choices in life. Because almost everything – all external expectations, all pride, all fear of embarrassment or failure – these things just fall away in the face of death, leaving only what is truly important. Remembering that you are going to die is the best way I know to avoid the trap of thinking you have something to lose. You are already naked. Many of us are riddled with fears of every nature. The primary ones include fear of social failure, loss of name, fame and social standing, loss of affection and personal esteem in relationships and illness. We also fear suffering violence from others, suffering violence from nature, economic hardship, moral and spiritual failure (not being true to one’s ideals) and finally death. Many times one may direct these fears into self-destructive tendencies, an unconscious drive towards failure, or even suicide. It can be said safely that other fears stem from any or all of the above. This includes some of our fears of the unknown, fears we cannot quite identify. When we experience any kind of fear we must first try to place it in one or the other of the above categories. Many of our fears are mixed bags from the above categories. We need to analyze all these and find spiritual antidotes for them. Athletes epitomize physical perfection and perform gravity-defying tricks. On the surface, athletes are the perfect species. But underneath the flash and glamour is mystery. For many athletes, a fearless nature on the field is complemented by a terrified mindset away from it. Fear is something that takes a toll on all of us, including the innately fearless. We often allow this fear to overtake our courage, holding us back from reaching the heights of our potential. Personally, I believe that without fear, we would not be able to fully grasp its opposite – courage. As is pain to pleasure, and sadness to happiness, fear can act as a catalyst towards growth in courage if used as a controlled tool, instead of as something that controls us. This desire to expand is an instinctive part of our nature. We may not always follow it, but inside of us, dormant perhaps, is this tendency, this urge, to become more of who we are. However, realizing that potential is a gradual process. It doesn’t happen in an instant. We expand in the direction of our potential much like a balloon expands as air is slowly blown into it. In contrast to our desire to expand is our tendency to gravitate toward our comfort zones. A comfort zone is any place, situation, relationship, or experience where we don’t feel any threat to our sense of well-being. It is where we feel safe. It is usually a known place or situation where we feel some control or at least we usually know what is going to happen. In our busy and complicated lives, our mind must deal with numerous details as we plan and orchestrate our lives. Our mind can shift effortlessly from present reality to past incidents or future possibilities within seconds. When considering our future, whether that future is one hour or ten years away, the mind can creatively project us into any situation it chooses, and often it does. If we are generally a positive person, most of these projections will be of a positive nature. Likewise if we are generally a negative person, most of our projections will be negative. As a point of agreement between the East and West, the future is seen as promising ascension to a higher level of reality. Yet even here there is a difference. In the West this vision of the future may be motivated by a fear of personal death. In the West, given our emphasis on individuality, we fear our personal death and hope for a continuation of our self (our soul) in Heaven. The promise in the East, for example within Buddhism, is an escape from the personal struggles of life by ascension to Nirvana, a breaking free of the “Wheel of Time” or the “Karmic Wheel,” but there is no personal immortality – in fact, there is a transcendence of individuality and personhood. Some would argue, however, that in both East and West the motive behind their visions of the future is to somehow contend with and transcend the transience of time. Fear is the result of our mind becoming fixated on images of an undesirable situation we “fear” will happen to us in the future. The effects of this fear are very real, and they have their consequences. It is not just an unpleasant experience to be ignored or accepted stoically. Fear is a very powerful force that those who are unaware of Mind Power often use against themselves. Even those of us who understand and practice Mind Power can fall within fear’s grasp if we are not diligent. Fear is the mind projecting within itself images of what it does not want to happen. If the fear is not recognized and dealt with early on, it can and will find root within our consciousness. When this happens fear then becomes a daily occurrence, and if these thoughts are allowed to repeat themselves over and over again, they will eventually take an imprint on a subconscious level. Once this happens the subconscious mind begins to attract the exact experiences we have been projecting. I want to say it is Mind Power in reverse, but it is not. It is yet another example of how Mind Power works so effectively even when we use it unwittingly against ourselves. It’s been said that fear-based media has become a staple of popular culture. The distressing fall-out from this trend is that children and adults who are exposed to media are more likely than others to (a) feel that their neighborhoods and communities are unsafe, (b) believe that crime rates are rising, (c) overestimate their odds of becoming a victim, and (d) consider the world to be a dangerous place. News is a money making industry; one that doesn’t always make the goal to report the facts accurately. Gone are the days of tuning in to be informed straightforwardly about local and national issues. In truth, watching the news can be a psychologically risky pursuit, which could undermine your mental and physical health. News programming uses a hierarchy if it bleeds, it leads. Fear-based news programming has two aims. The first is to grab the viewer’s attention. In the news media, this is called the teaser. The second aim is to persuade the viewer that the solution for reducing the identified fear will be in the news story. If a teaser asks, “What’s in your tap water that YOU need to know about?” a viewer will likely tune in to get the up-to-date information to ensure safety. The success of fear-based news relies on presenting dramatic anecdotes in place of scientific evidence, promoting isolated events as trends, depicting categories of people as dangerous and replacing optimism with fatalistic thinking. Fear-based news stories prey on the anxieties we all have and then hold us hostage. Being glued to the television, reading the paper or surfing the Internet increases ratings and market shares – but it also raises the probability of depression. In previous decades, the journalistic mission was to report the news as it actually happened, with fairness, balance, and integrity. However, capitalistic motives associated with journalism have forced much of today’s television news to look to the spectacular, the stirring, and the controversial as news stories. It’s no longer a race to break the story first or get the facts right. Instead, it’s to acquire good ratings in order to get advertisers, so that profits soar. When certain fears become overwhelming, they incapacitate us, and render us unable to take even a slightly bold step forward. They make us escape into ourselves, to the point of making us, in extreme cases, catatonic. Before we reach such an acute stage, we are advised to seek professional counseling from a psychologist or a psychiatrist. A psychologist helps us by way of analyzing our problem. A psychiatrist determines whether the problem is of neural-hormonal origin that may be cured through medication. In the field of psychological counseling, there are many systems and methods, from Freudian analysis to transactional analysis. These do not take questions of God and soul into account in trying to understand what has transpired in shaping a person’s mind. The analysis is based on the lesser human urges. The same is true with health. Fear of poor health or illness means you’re thinking thoughts of poor health and illness, in fact focusing on poor health and illness, and we all know and understand what the likely outcome will be if we continue. Fear of failure, fear of poverty, fear of never getting ahead, fear of never meeting someone to share your life with, fear of ______ (you fill in the blank) is almost always setting in motion the exact events we do not want. It is sowing in the fertile inner garden of the mind seeds for plants we don’t want to reap. It is ludicrous, counterproductive and totally unnecessary. So often we talk about health as it relates to fitness and nutrition, but could the greatest factor in our health really be our state of mind? We have heard “stress” will kill us but yet that doesn’t stop us from worrying about things. We feel helpless and say we have depression, when we don’t own anything…..we just experience it. Happiness is there for us every day to find and experience, yet most of us get caught up in things that probably won’t even matter in a week…let alone a month or year. Fear and doubt keep from from even reaching higher levels of whatever we may want to achieve in life. Time to stop. No more I say. The past is done and the only thing that matters is the steps we take right now…and every other present moment. Time for us to take control and see what is really going on. Time for some real perspective in life. Looking around at the marketing in our local health food stores, health clubs, and the marketing of various health supplements around the area, there is a lot of negativity and fear. Marketing tends to focus on all the toxins and bad things in our food and lifestyles and how to eliminate them. Exercise is often focused on how you have to “work hard”, sacrifice and push yourself for your own good. The problem is in some people this creates a unhealthy feedback loop of fear and negativity that actually hurts the person physically and mentally. Every indulgent fun food becomes the enemy and a reason to deny cravings of the body, or a reminder of failure. Exercise becomes an unwelcome duty to be suffered through. Meager results on the scale and with the waist measurement become another indication of failure. Those failures combined with the media images of skinny healthy having fun and the drum beat of “obesity equals disease” can drive people beat themselves up even more. The result is more denial, more “detoxifying”, more focus on failure and fear of the dire medical consequences that lie ahead. But, there is a better way. Health is about living life. Truly healthy people do not have a overwhelming fear that drives their decisions. Their decisions are based on fun and happiness. The answer is lifestyle. Develop a healthy lifestyle that supports health, life and above all joy and happiness. Think about it: what are you scared of? Something that you don’t like or something unknown to you, isn’t it? For instance, if you are scared of not being able to finish your work on time, it’s because you probably do not like being scolded by your boss, or if you are scared of playing a badminton match, it’s probably because you are unsure of who is going to win. Now comes the tricky part. In order to realize this aspect of our human nature, which is to expand and grow, we must leave our comfort zones. We must do things that feel uncomfortable. There is very little growth, expansion, or progress when we are spending our time and energy in those places we would call our comfort zones. Moving out of our comfort zones doesn’t happen without effort on our part. Our effort produces the expansion. However, this effort usually involves overcoming or dealing with some type of fear. We could call the part outside the circle the “discomfort zone,” because the name implies that we don’t feel especially comfortable “out there.” Nevertheless, if we are to expand and grow, that is where we must put ourselves. Moving into our discomfort zones invariably involves facing our fears. when we fear something, it becomes easier to do something to change the feelings of fear. So is there something that can convert this fear back to love? Meditation and exercise have well-documented mood-enhancing, stress-management, and disease-prevention effects. What you may not know, though, is that they also have a profound impact on creativity, decision-making, and problem-solving. Recent research even shows certain approaches increase brain mass, something that’s always been thought impossible. These two daily practices bolster your ability to go to that edgy place where the good stuff happens and stay there long enough for next-level innovation to emerge. Together, they combine to create the single most powerful mindset, creativity, and innovation force multiplier on the planet. If you have a little fear – relax! Like salt in the food, a little bit of fear is essential for you to be righteous. Imagine what would happen if people had no fear at all? Students had absolutely no fear of failure – would they study? If you had no fear of falling sick, would you take care of your health? So be wise and acknowledge the usefulness of having a little fear in you. This entry was posted in Uncategorized and tagged A Virus Called Fear, ancient egypt, Ancient Egyptian religion, athletes, Boston, Boston Bombings, consciousness, Death, education, egypt, enlightenment, Ernest Becker, Eternal life (Christianity), Fear, Fear of Death, Fear of LIfe, Free, god, happiness, health, life, live, love, Malcom X, Mark Twain, muslim, nature, Necrophobia, No Fear, Oklahoma City, one love, philosophy, Science, Ted Talks, Thought, United States, What Fear Can teach us, Woman Vs. Workout. Bookmark the permalink. 2 Responses to Fear Is Nothing But Love Upside Down.